REUTERS/Eduardo MunozMembers of the Macy’s Thanksgiving Day Parade balloon inflation team work on Spiderman during preparations for the 88th annual Macy’s Thanksgiving Day Parade in New York. 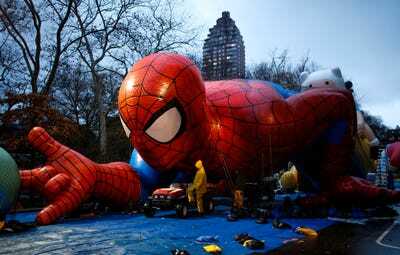 Spiderman, Snoopy, SpongeBob Squarepants and other giant balloons in the Macy’s Day Parade could be grounded by high winds predicted Thursday, parade officials and city police said. 2. The price of oil is still falling and OPEC is not going to cut production. The cartel meets today to discuss the glut of supply and the economic havoc it is wreaking on nations like Russia that need that price to go up. Read more from Reuters. 3. The EU will meet today to decide whether Google will be broken up. Even if they vote to end the search giant’s virtual monopoly it is far from clear that a breakup would actually happen — but a regulator can always dream! 4. A huge storm is turning Thanksgiving in the US into a travel nightmare. 600 flights cancelled so far on the national holiday, NBC reports. The US will be basically out of commission all day, FYI. 5. There might be a vaccine for Ebola. A drug developed jointly between the US government and GlaxoSmithKline will be tested in Africa, the Wall Street Journal says. 6. Microsoft accidentally announced it is to acquire mobile email startup Acompli. The company published a blank blog post with a URL that says so … no confirmation yet. Read more on Techcrunch. 7. Australian cricketer Phil Hughes has died after being struck on the head by a “freak” ball. He was wearing a helmet, but the ball hit him on the neck, the BBC says. 8. US Supreme Court Justice Ruth Bader Ginsberg is recovering in hospital from cardiac surgery. At 81, she is the oldest justice on the high court. People, obviously, are wondering if she might step down and be replaced, Slate says. 9. A Bollywood actress has been given a 26-year jail sentence by a Pakistani court because she acted in a wedding scene on TV. Veena Malik will appeal, and the sentence is a regional one that may not apply to other parts of the country, the Independent says. 10. Some layoffs at Walmart in China. The 30 mid-level management layoffs come after the chain closed 20 stores in the country. Read more at the FT. The earth has a a Star Trek-like invisible shield that protects us from deadly electrons. A cold gas zone forms a “glass wall” barrier about 7,200 miles around us. Phew!